Beginning of this week; during the Tech Days 2008 in Paris, I had the great pleasure to discuss with Aurelien Verla and Grégory Renard about Tech Head Brothers authoring and publishing tool. We went then with Aurelien on more details about the tool and I must say that I came to is conclusion, even if the tool is a really good show case it could be better to hide the XML part to the users. 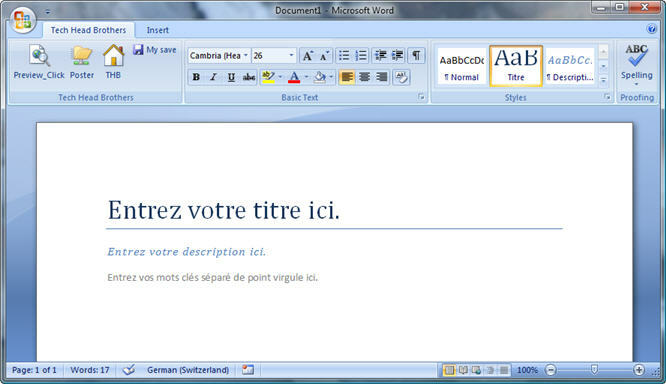 I then asked Julien Chable some advise about WordML and the way to integrate my idea into Word 2007. Finally I had a start point. So I decided to start on this new version of the tool from scratch. It will be better using the Word 2007 Ribbon. I have to say that the integration in Visual Studio 2008 is just great! Without any first read on the subject, no documentation access (in the train back home, no wifi still), I made what you can see on the screen shot. So in the future I hope that authors of Tech Head Brothers will enjoy this new tool, that will make I hope their life easier.